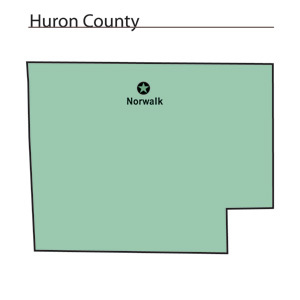 On February 7, 1809, the State of Ohio authorized the creation of Huron County. Residents named the county after the Huron people, also known as the Wyandot. The county was originally a portion of the Connecticut Western Reserve and was also part of the Fire Lands. Huron County is located in the north-central portion of Ohio. The county seat is Norwalk, which is the county's largest population center, with 16,238 residents in 2000. The county experienced almost a six percent increase in population between 1990 and 2000, raising the number of residents to 59,487 people. An average of 121 people lives in each of Huron County's 493 square miles. Huron County is heavily rural, with urban areas comprising less than two percent of the county's land mass. With more than one thousand farms in the county, many residents find employment in agriculture, with manufacturing establishments and sales positions coming in second and third respectively. The county's average income was 22,720 dollars per person in 1999, with less than nine percent of the population living in poverty. President Rutherford B. Hayes and Civil War General James McPherson rank among Huron County's more famous residents.